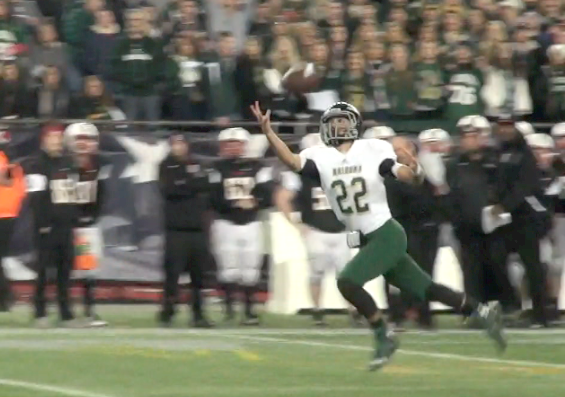 Now-senior Nate Mansour makes a one-handed grab in last year's state championship game. We make the final stop on our Central Mass football road trip today with the reigning Division 2 state champion Chieftains. Nashoba replaces a talented senior class that provided leadership throughout its trip to Gillette, and helped the Chieftains pull off last-minute wins against Leominster, St. John's and Springfield Central, before capturing a state title against Reading. But don't sleep on this year's team, which brings back a few key players in the trenches, and some real talent in the backfield. Here's what to expect from Nashoba in 2016. While Nashoba does lose do-it-all athlete Jake Benjamin from last year's backfield, they do return physical fullback Jake Fire, a senior captain, and a pair of speedy backs who broke several big runs late in last year's playoff push. Senior Nate Mansour contributed all over the offense last year, making a fantastic one-handed catch and run for a touchdown in the state championship game. He returns, along with senior Nick Rodgers, who showed the speed to get around the edge on several end around and reverses late in the postseason. That trio will give Nashoba one of the most versatile, and experienced groups in the region, and coach Jamie Tucker is also excited about his new quarterback, senior Owen Fay. Fay actually started last year's opener while Robby Atwood was out, and Tucker sees a lot of Atwood's confidence and leadership in Fay. It will be tough to replicate Atwood's performances under pressure and mobility, but Nashoba does have some experience to lean on. Losing guys like Mike Curtin and Jake Hicks is never easy, but Nashoba does return senior captain Bobby Denaro -all 280 lbs of him- at left tackle on offense and defensive tackle on the other side of the ball. Much will be asked of Denaro, but he was already one of Central MA's best two-way linemen last year, so the big guy certainly seems up to the task. Senior Sam Keith returns at right tackle, and will also start at defensive end, a spot where the Chieftains will look to replace Egan Bachtell's play-making abilities. Junior Rob Ryan will start at the other defensive end spot, and classmate Duncan Wilgress-Pipe looks promising at defensive tackle as well. Despite all the losses from next year, Nashoba will again be one of the biggest and toughest teams along both lines in the region. With Atwood, Benjamin and Tony Kennon all gone from last year's fantastic secondary, Mansour will step into a leadership role as a starting cornerback. Senior Shane Regonini will start opposite Mansour, and junior Breese Hill has the speed and toughness to be a complete safety. The linebacker corps should again be very good, with junior Kyle Hume returning after a promising sophomore campaign, and Fire coming back next to him on the inside. Rodgers will add some speed and coverage ability to the group, and senior Luke Danby ties together this four-man group. Nashoba opens 2016 as the reining Division 2 state champion, and as a member of the new Division 2A Central. Essentially, the Chieftains drop from the largest division in Central Mass into the second largest. That means the road back to Gillette no longer goes through teams like Leominster and St. John's (not to mention Shepherd Hill, a team that just jumped up to Division 2), and rather goes through programs like Doherty, Tantasqua, Fitchburg and Marlboro. Those are all solid programs, but with Doherty rebuilding, Tantasqua looking to replace a special talent like J.J. Howland, and Fitchburg and Marlboro coming in as wild cards, the Chieftains seem in decent shape during their own reload. The schedule does bring some big games, including the opener Friday at up-and-coming Algonquin. That game will tell us a lot about both of these teams, and it will be interesting to see how the Chieftains' revamped secondary looks good against a plenty capable Algonquin passing offense. Week 2 is the home opener against Shrewsbury, another program getting plenty of preseason hype, before Nashoba travels to Groton-Dunstable. The Chieftains then host St. John's September 30th, before heading to Fitchburg and Marlboro the next two weeks, then returning home to face Shepherd Hill. Yeah, it's gonna be tough for this team to catch it's breath during that stretch, and they close out the regular season at home against what should be an improve Westboro team. On the whole, it looks like a pretty challenging schedule, featuring three or four of the best teams from Central MA's largest division (Algonquin, Shrewsbury, St. John's and Shepherd Hill), and a pair of huge road games against divisional opponents (Fitchburg and Marlboro). With talent and experience back at linebacker, and plenty of toughness up front, this team looks more like it's re-loading, rather than re-building. So, look for Nashoba to again be a favorite in its division in 2016.